Zoning in project corridor to focus on housing, density to maximize benefits of proposed light rail line. For the Southwest Corridor MAX Project to fully succeed, building heights must be increased along the line being planned from Portland to Tualatin through Tigard. This is especially true around the proposed light rail stations, where affordable housing advocates already envision mid-rise apartments not allowed by the current zoning in many areas. The Portland City Council unanimously approved the recommended route for the proposed MAX line last Thursday. Some details will require additional approval before work can begin in 2022 — if all funds are secured. The cost of the 12-mile line is currently estimated at $2.3 billion to $2.9 billion, with the federal government expected to pay for half of it. Mayor Ted Wheeler declared the project a "necessary vision, a bold vision" and that the city "needs to make big infrastructure investments like this." He also noted how proud he was the discussion included more than transportation, that housing and livability were also in the mix. But the Portland Bureau of Planning and Sustainability is already in the startup phase of a project to look at zoning in the corridor. The initial focus in 2019 and 2020 will be a local area plan for the West Portland Town Center, which includes the complex Crossroads intersections of Southwest Barbur Boulevard, Southwest Capitol Highway and Southwest Taylors Ferry Road, along with the existing Barbur Transit Center just north of it. Some smaller-scale zoning refinements also will be examined around the Ross Island Bridgehead, where a related project has been proposed to realign some of the connecting streets, freeing up nearly three acres for development that could support as many as 400 new homes. Senior planner Eric Engstrom says work on other station areas will come later, after the locations are finalized. The city of Tigard is expected to do the same for its stations. The line is expected to include 13 stations and seven park-and-ride lots. It should be no surprise that city planners are already looking at increasing densities in the corridor. The project was conceived as much more than a new MAX line when planning first began in earnest in 2011. It is based in part on previously adopted plans — including Portland's Barbur Plan and Tigard's Comprehensive Plan — that foresaw more intensive development in the corridor. The corridor planning is currently being overseen by Metro, the elected regional government, whose 2040 Concept calls for multifamily housing at or near transit stops. The most successful example to date is Orenco Village, where apartments and townhomes are concentrated around the Orenco MAX station in Hillsboro. Much of the process for reconsidering the zoning is outlined in a Memorandum of Understanding (MOU) between the project partners that was approved Oct. 10 and reviewed by the council last Thursday. It calls for TriMet — the regional transit agency that will build, own and operate the MAX line — to lead a Station Optimization Study that will identify potential redevelopment sites along the line, including those suitable for government-subsidized affordable housing projects. The MOU calls for TriMet to sell excess properties acquired for the project to Portland, to accommodate between 600 and 700 affordable housing units. Depending on the locations of the properties, some if not all of them may need to be rezoned for apartment buildings. Nearly half of the property near the potential station areas is currently zoned for single-family homes, the traditional residential development pattern in the corridor. As the project moves forward, TriMet will convene a Southwest Corridor Steering Committee to make final decisions on such things as the final alignments, station locations, and the size and location of park-and-ride lots. That group is expected to include representatives of the Oregon Department of Transportation, Metro, Washington County, Portland, Tigard, and Tualatin. Commissioner Chloe Eudaly will represent Portland on the steering committee. 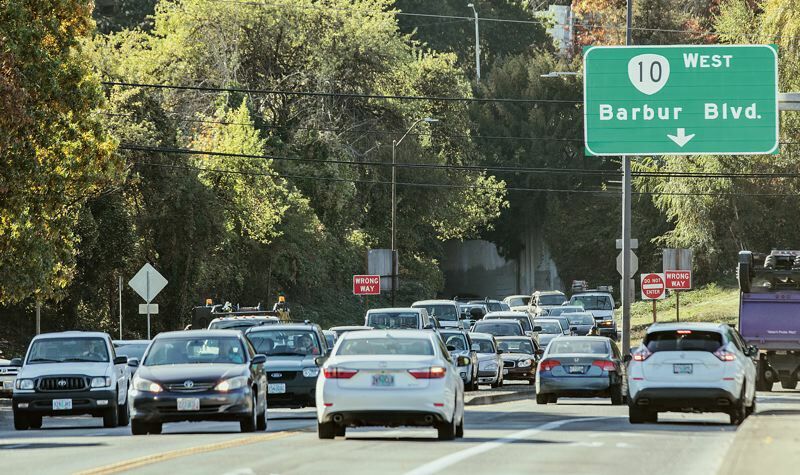 "There are many important project elements to be evaluated and refined in the weeks and months and probably years ahead, such as connections to Marquam Hill, the route through the Crossroads area," Eudaly said Thursday in the City Council session.